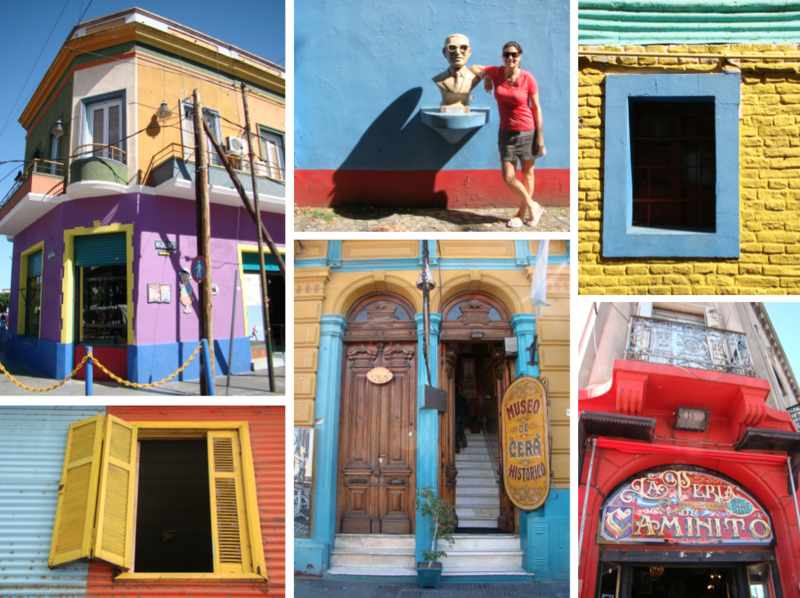 I hadn’t decided to write an entry for our Argentina trip until about half way in (while in Patagonia). 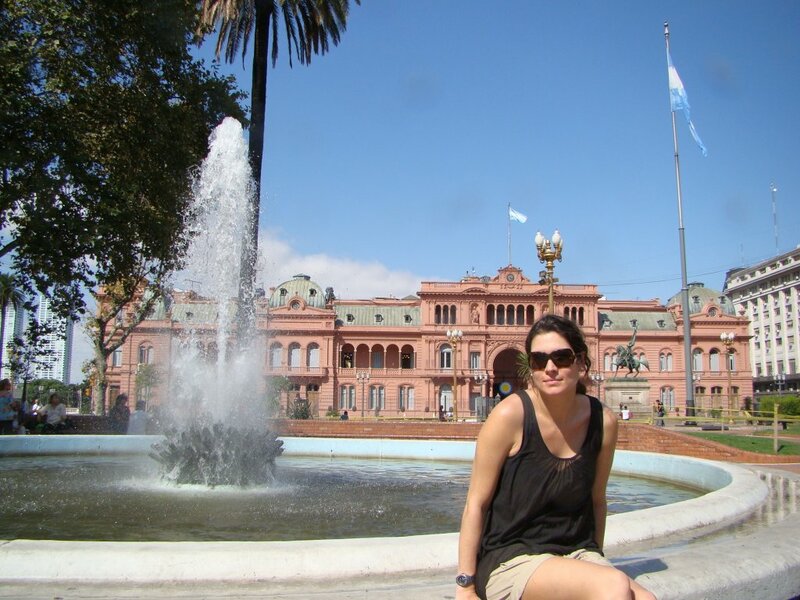 Something had just clicked after our day on the ice, exploring and admiring the mighty Perito Moreno glacier (but we’ll get to that later). 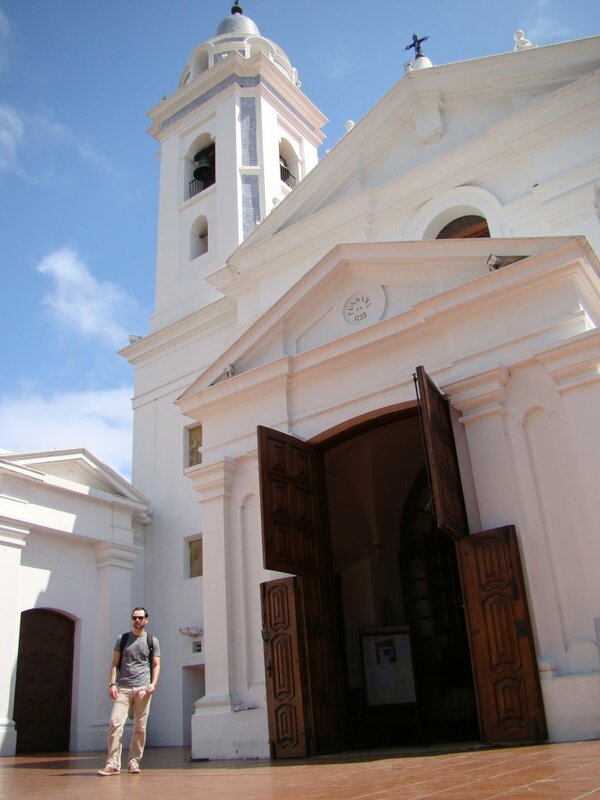 Besides, it would be selfish not to share our experience in what is an amazing country (that would consequently receive a lot of promotion on our behalf). 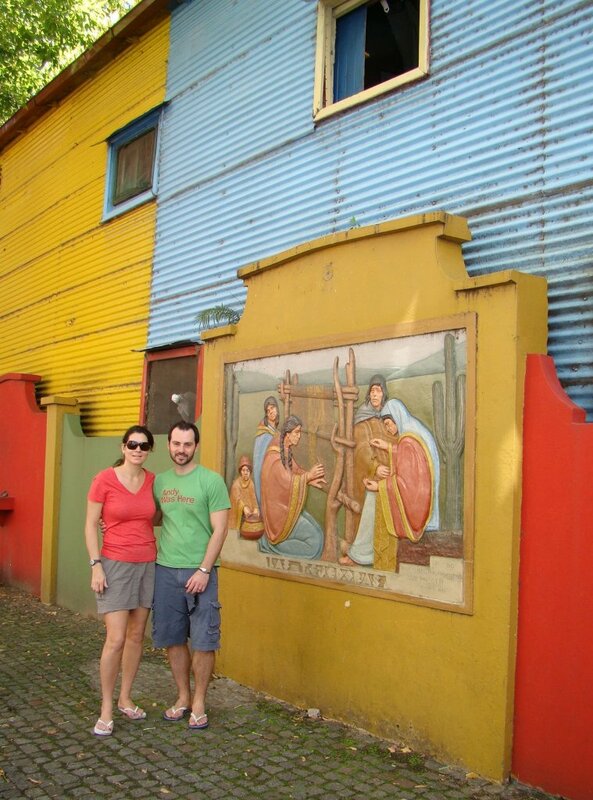 Our trip started in the historic capital (Buenos Aires), hopping around from one contrasting neighborhood (barrio), to another. 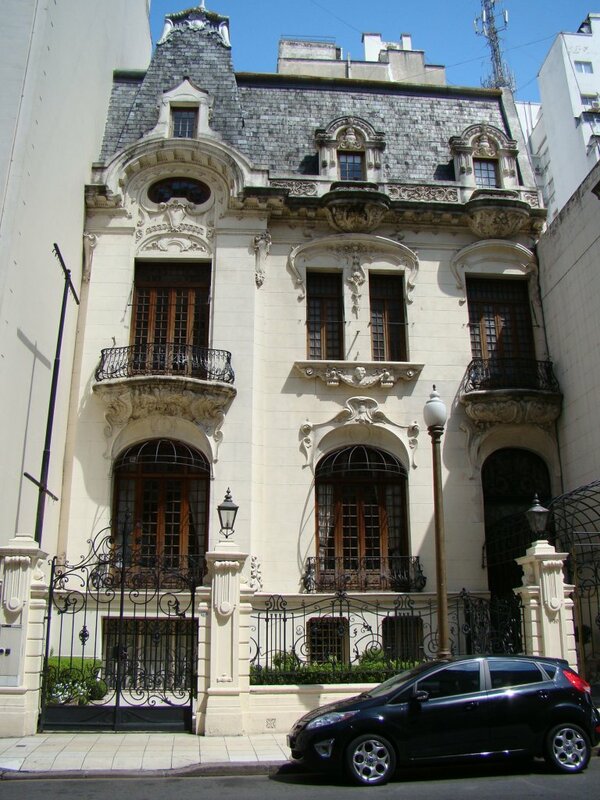 Buenos Aires has it all, a European look and feel defined by posh Parisian style buildings, grandiose palaces (in the upscale neighborhoods of Recoleta and Barrio Norte), impressive avenues and a mix of everything else good and bad. 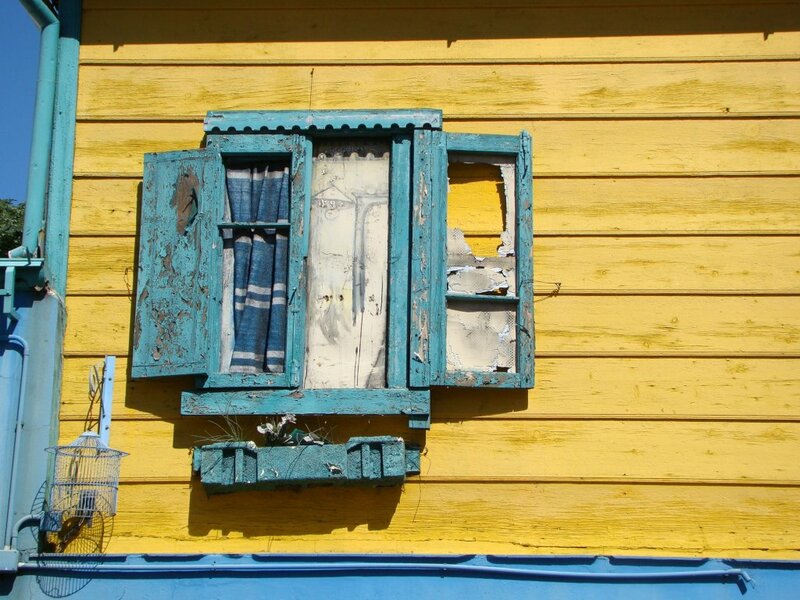 On the opposite end of the ritz lies Boca, a very blue collar and even poverty stricken barrio that’s actually one of the city’s main attractions for its Caminito (the neighborhood’s main touristic artery), boasting houses painted in vibrant red, yellow, green and blue. 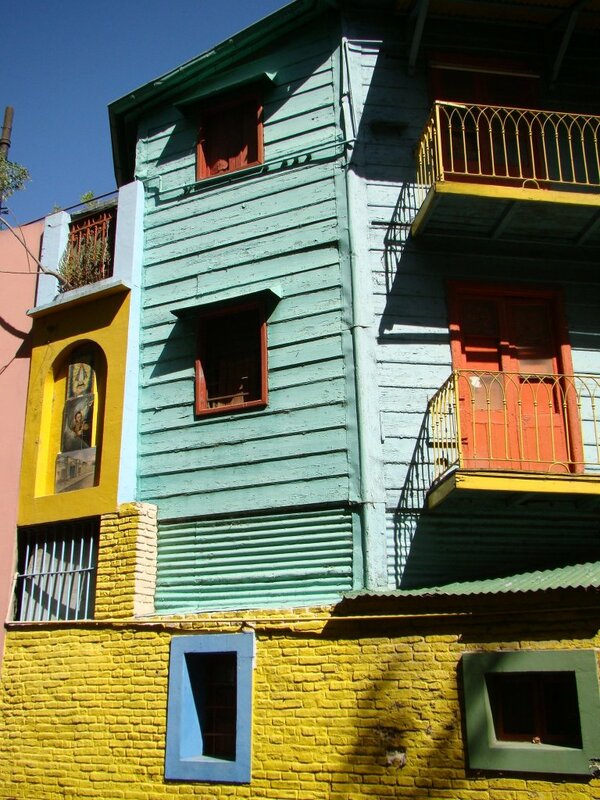 But the incredible color went deeper than the houses, it was also felt in Boca’s people making for an immensely expressive community. 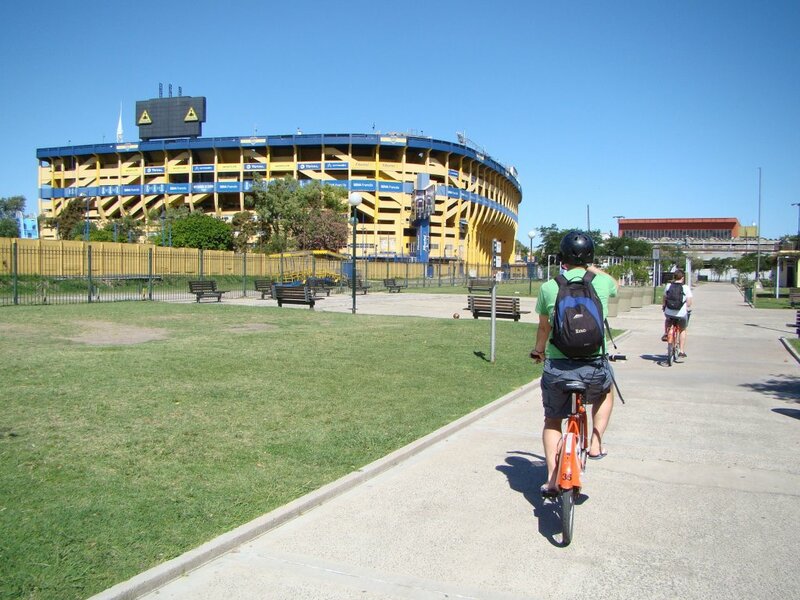 Boca is also renown for being the home of one of the city’s top futbol or soccer clubs – Boca Juniors – who’s most famous player was demi-god Diego Maradona. 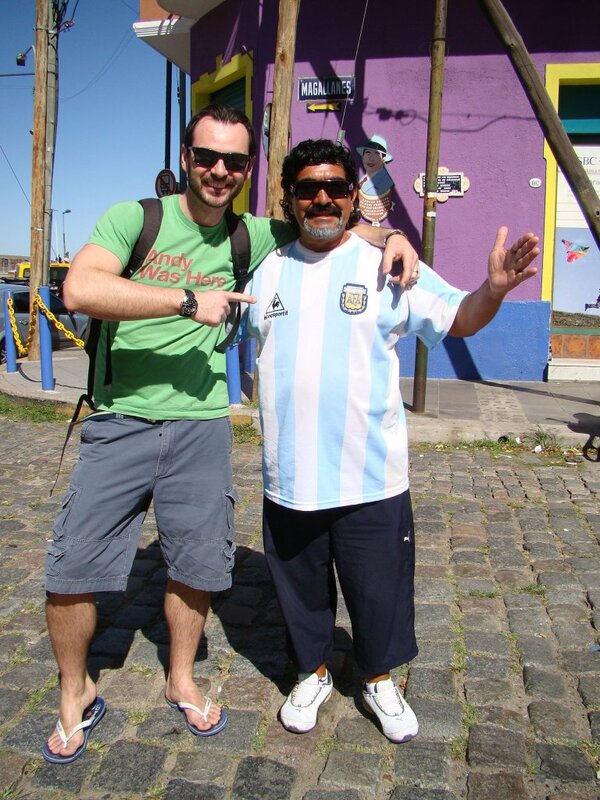 A picture with one of his impersonators in the Caminito was simply too much to resist and cost 40 pesos (about $6). 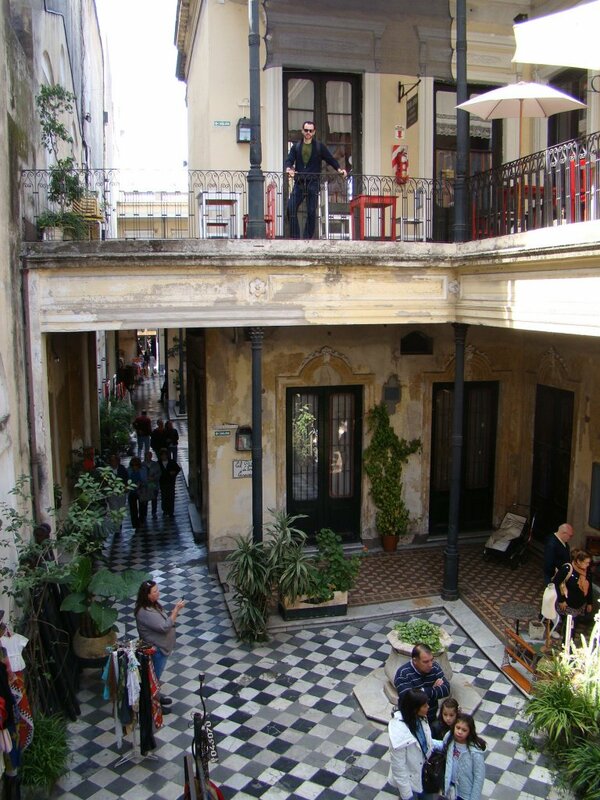 But in between the two extremes of upscale and gritty neighborhoods, there was plenty of middle ground which we found in our favorite barrios, San Telmo and Palermo Soho. 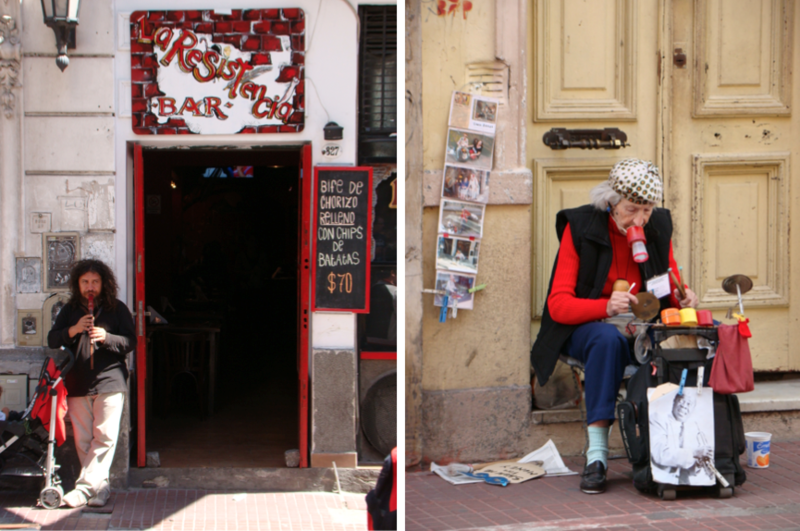 Distinctly different, San Telmo boasted a Bohemian vibe with plenty of character and artistry (and great architecture too). 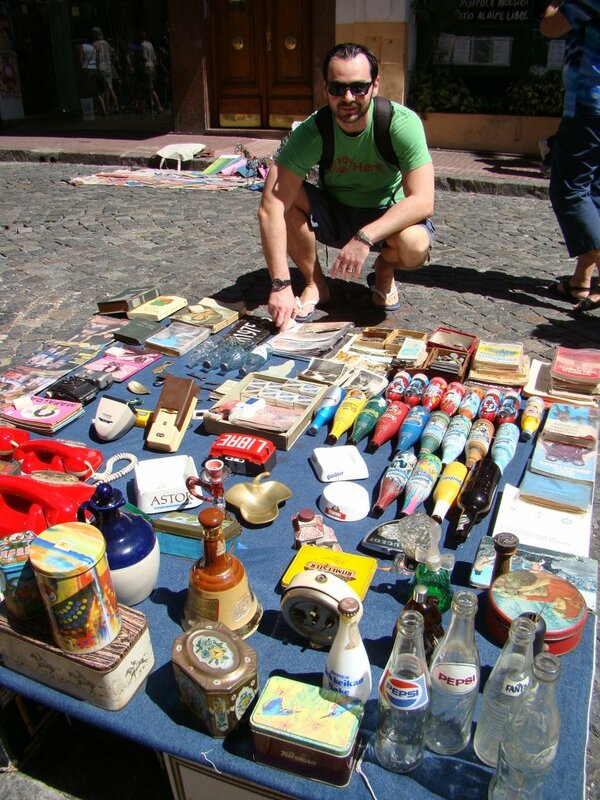 Point in case was the superfluous Sunday flea/antique market where we discovered numerous cool souvenirs and amazing art. 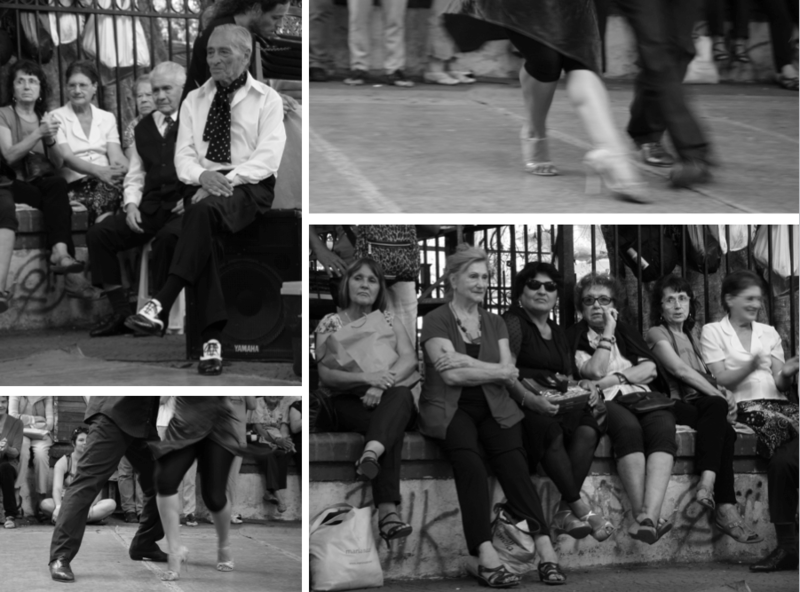 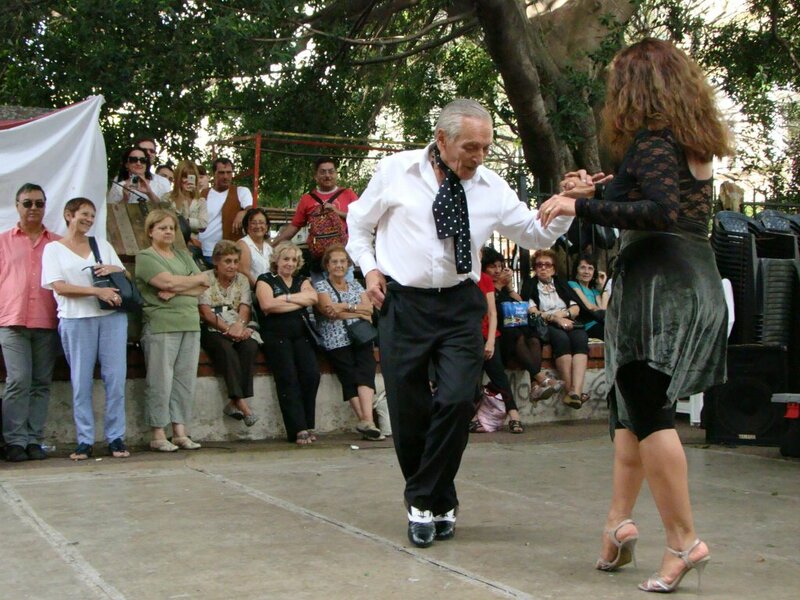 The neighborhood is also known for its Tango, often times exercised by street performers in front of sizable admiring crowds. 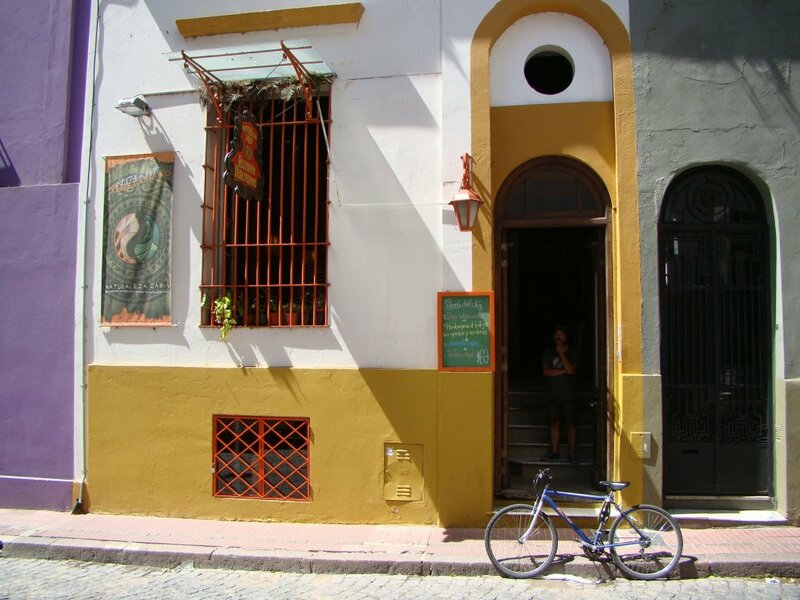 Running into pockets of tangoers naturally came with the flow of San Telmo’s intricate streets, many of which are still in original cobble stone. 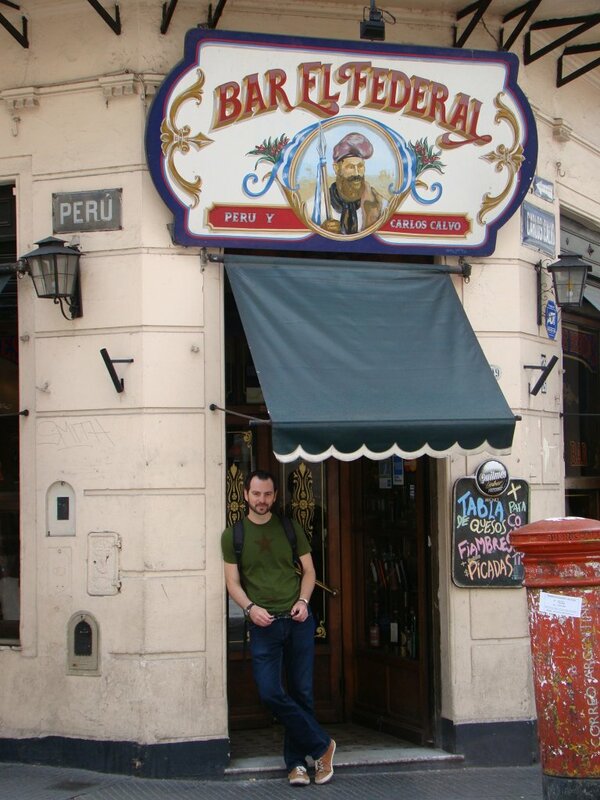 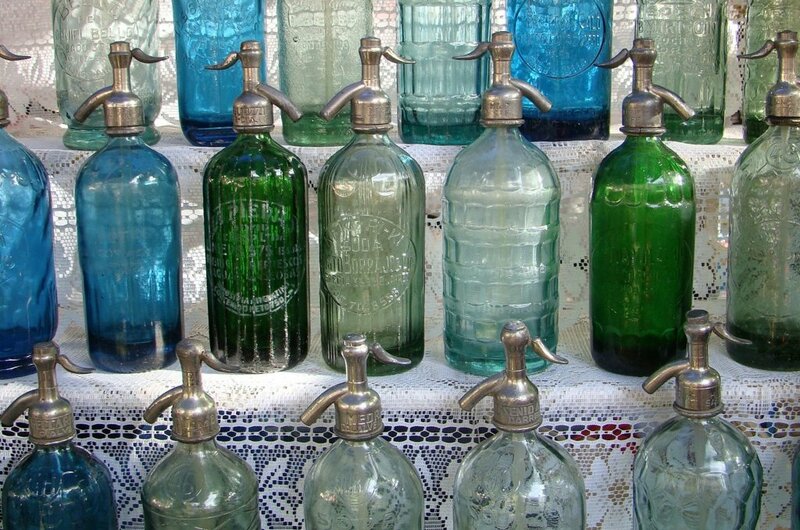 We decided to have some fun there and explore some of SanTelmo’s “bares notables” a handful of mid-19th Century bars that became famous for the “notable” clientele they attracted. 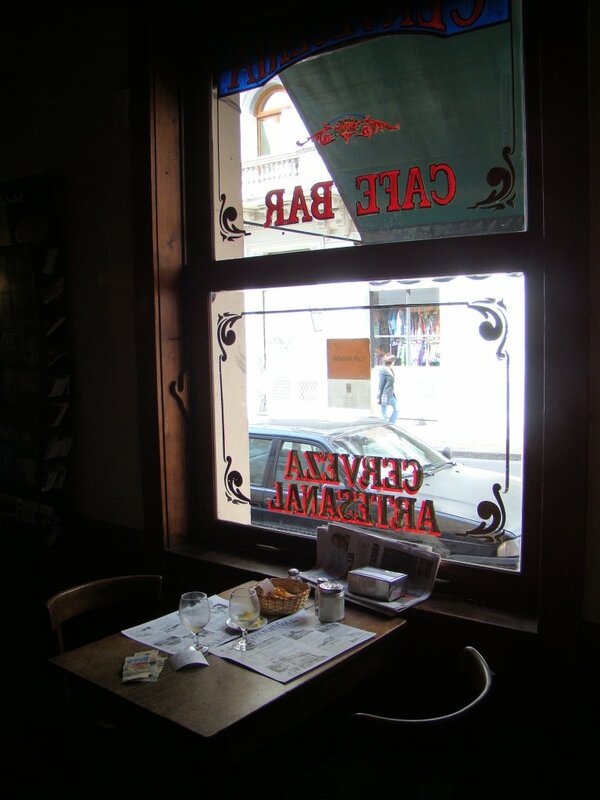 We made our way inside a handful and admired the original bar woodwork in many cases complemented by art nouveau detail and collections of relics from the past. 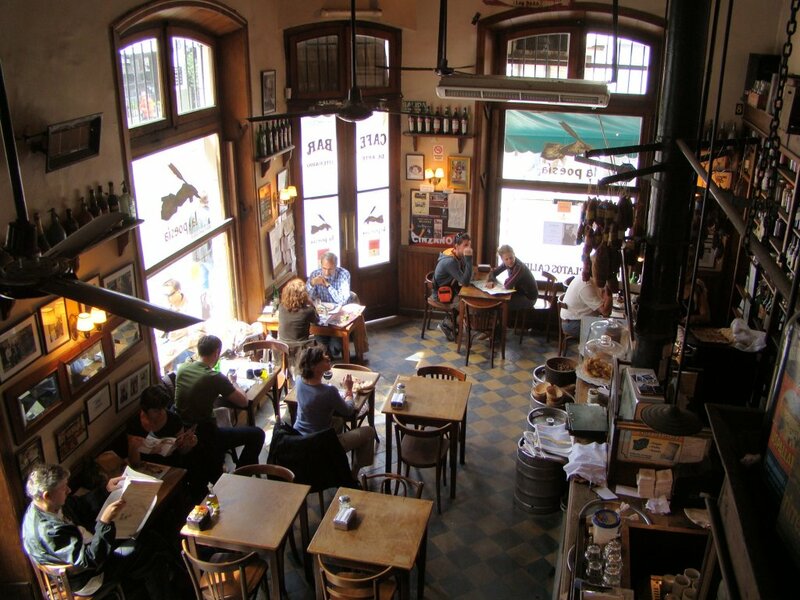 Black and white photos of famous personalities hung on walls alongside cool vintage posters while old bottles of liqueur lined the upper dusty shelves. 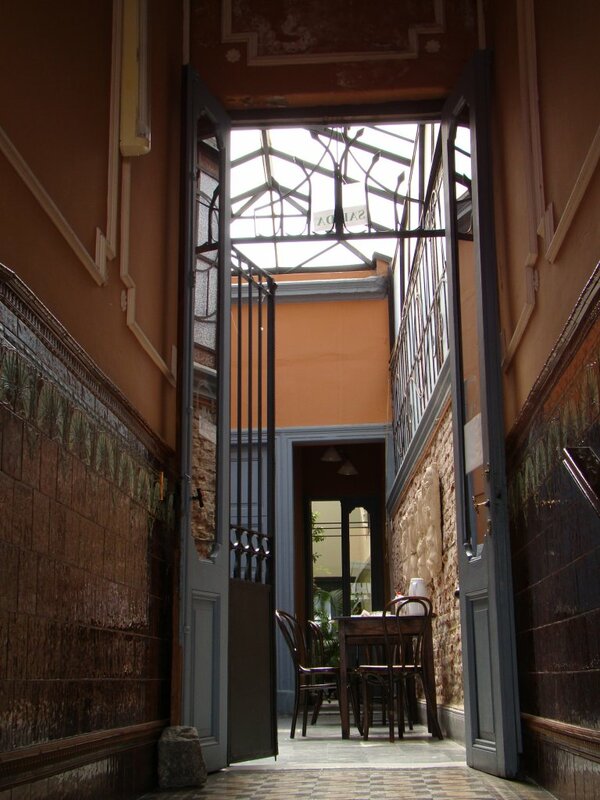 We were inspired by La Poesia and decided on lunch at this former literary cafe with exposed brick walls, old oak tables and chairs, and many relics from its older days. 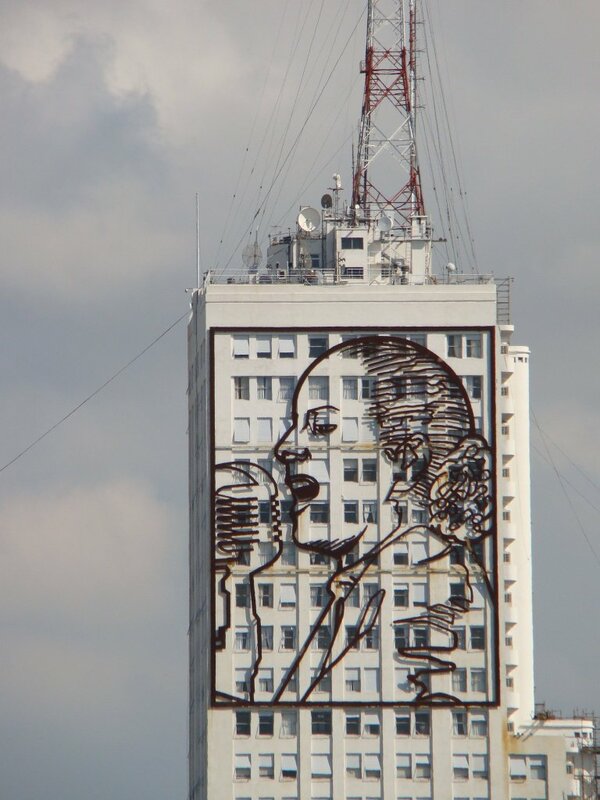 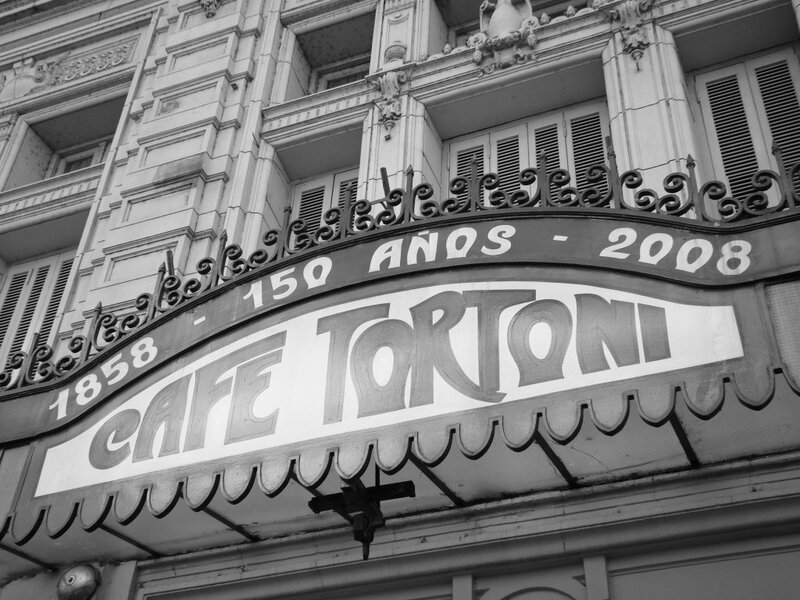 Soft tango numbers and Louis Armstrong classics emanated from the radio bringing on the fantasy of Buenos Aires in the days of Carlos Gardel (one of Argentina’s most renown singers from the 1920s and 30s). 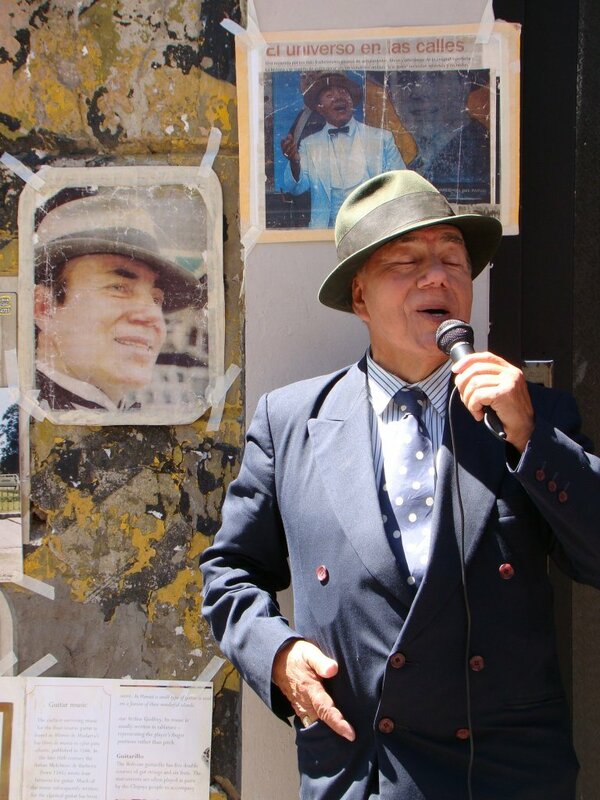 A few blocks away, an older gentleman suited up to play the part of Gardel captured our imagination by lip synching his melancholy classics. 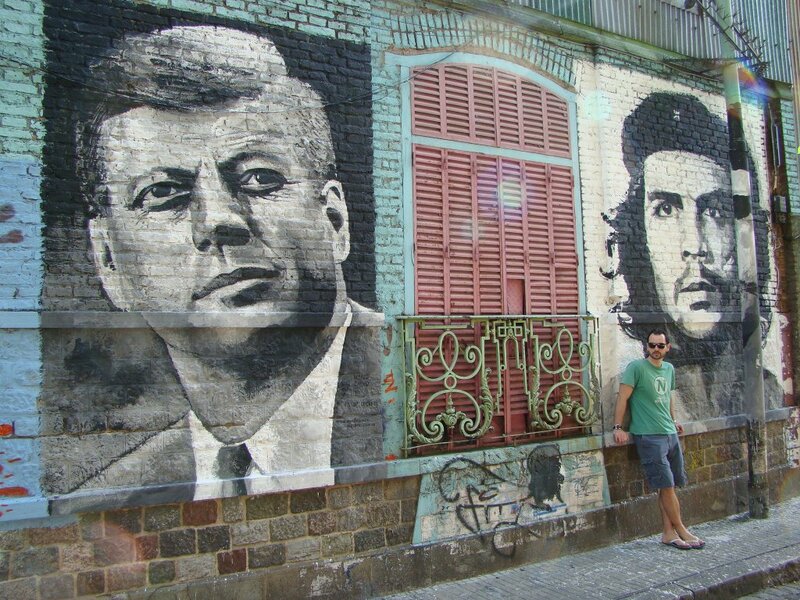 His expressive face severely weathered by time parlayed his longing for the good old days. 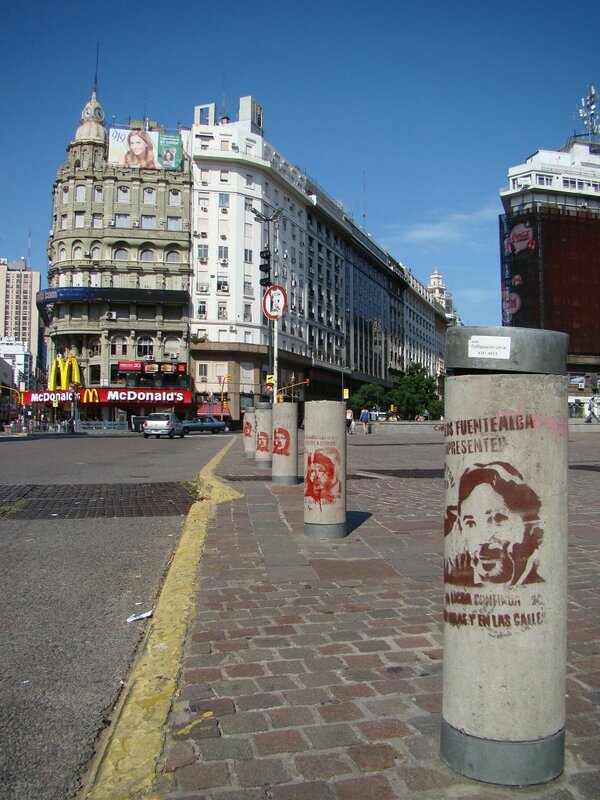 I observed him from across the street while part of me was consumed with inexplicable sadness. 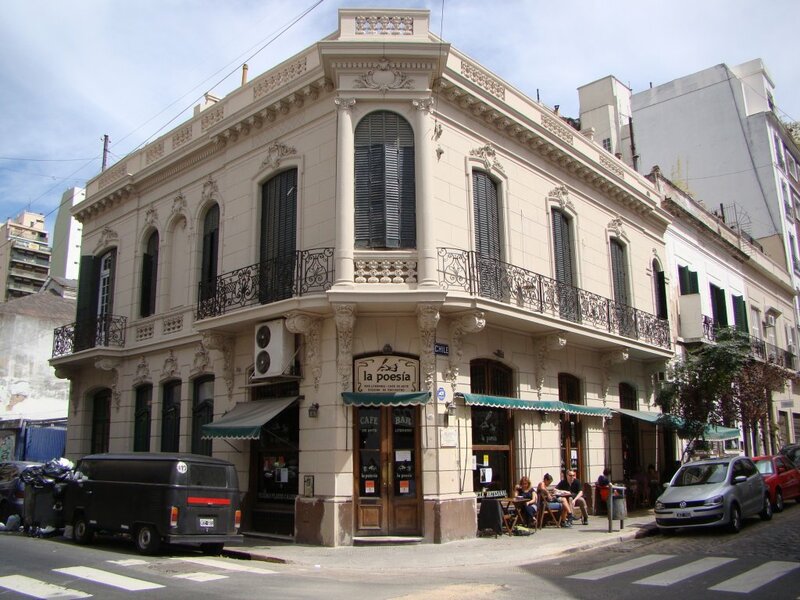 San Telmo’s bares notables were profound but the neighborhood is also littered with numerous other cafes, bars, restaurants and makeshift open air barbecues or “asados”, serving up the classic sausage in bread known as “choripan“. 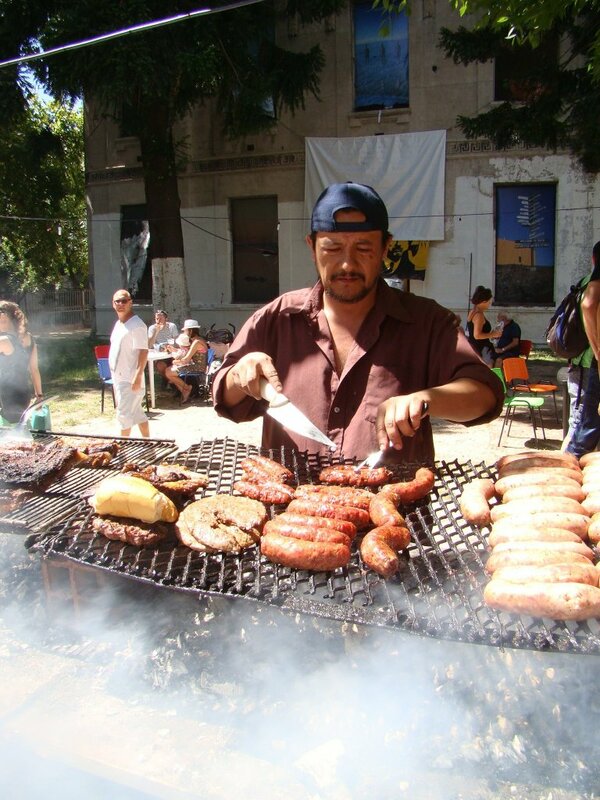 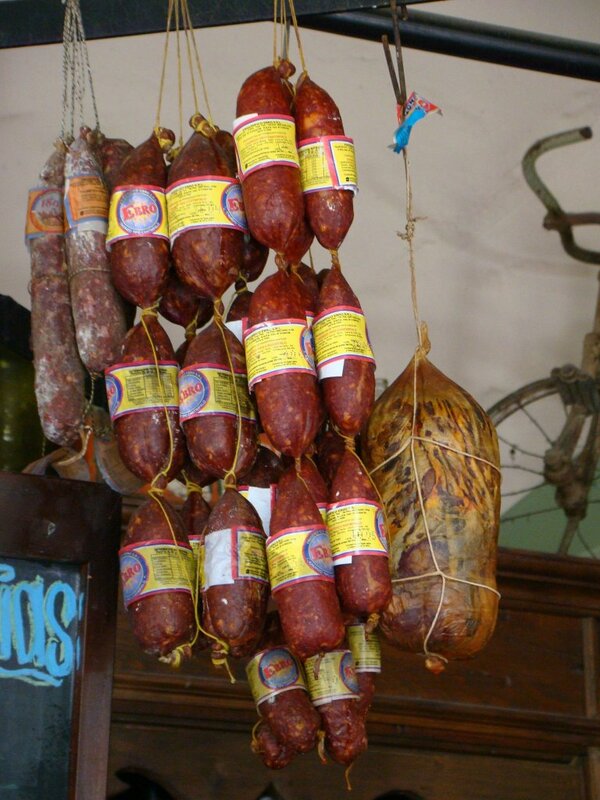 As perfunctory as the picture with “Maradona” was in Boca, so was a tasty “choripan” in San Telmo. 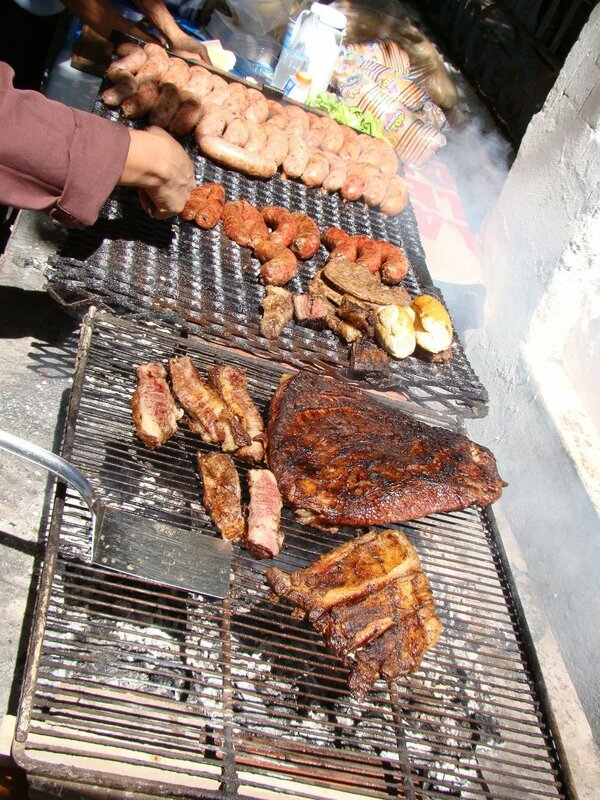 I enjoyed mine with an oversized (1 Liter), bottle of Argentina’s most popular beer (Quilmes), at one of the makeshift outdoor asados. 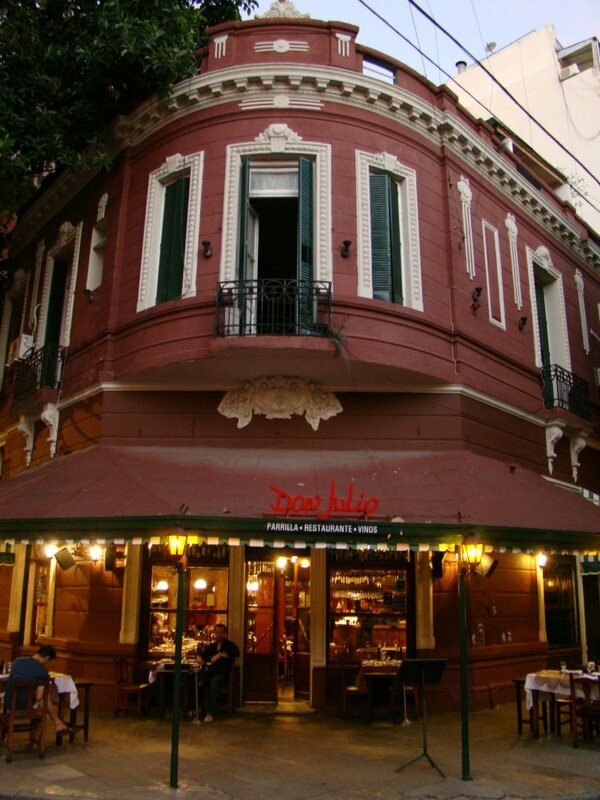 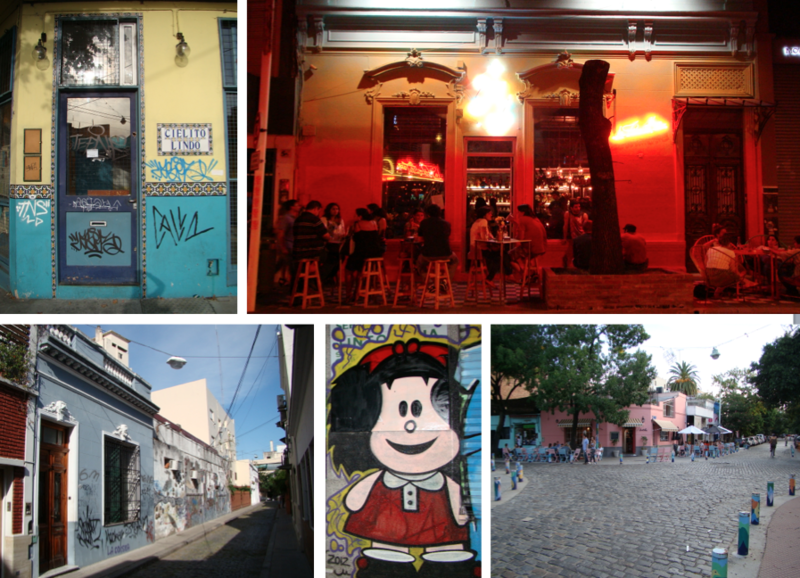 Last barrio on this list but actually our first to discover was Palermo Soho. 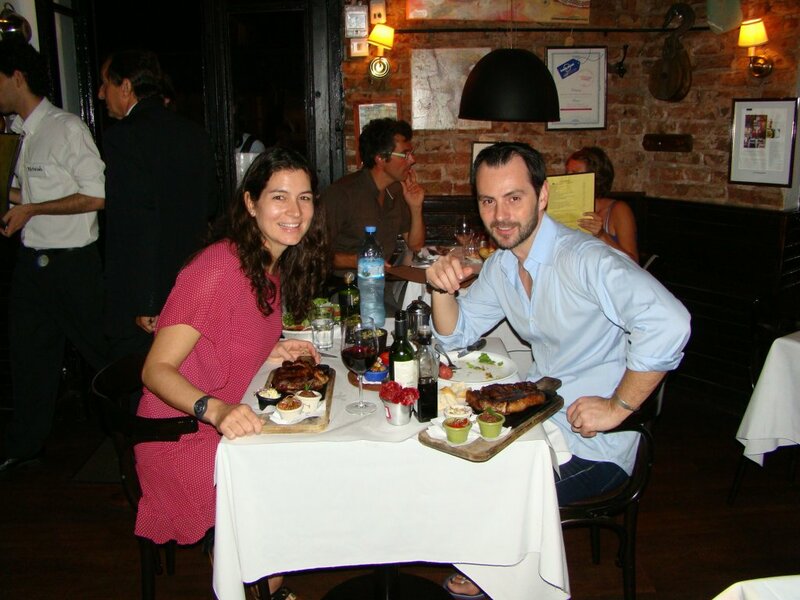 Having our hotel there made it easy to explore the neighborhood’s New York City Soho-like streets filled with couture shops, art galleries, book stores and numerous cafes and restaurants. 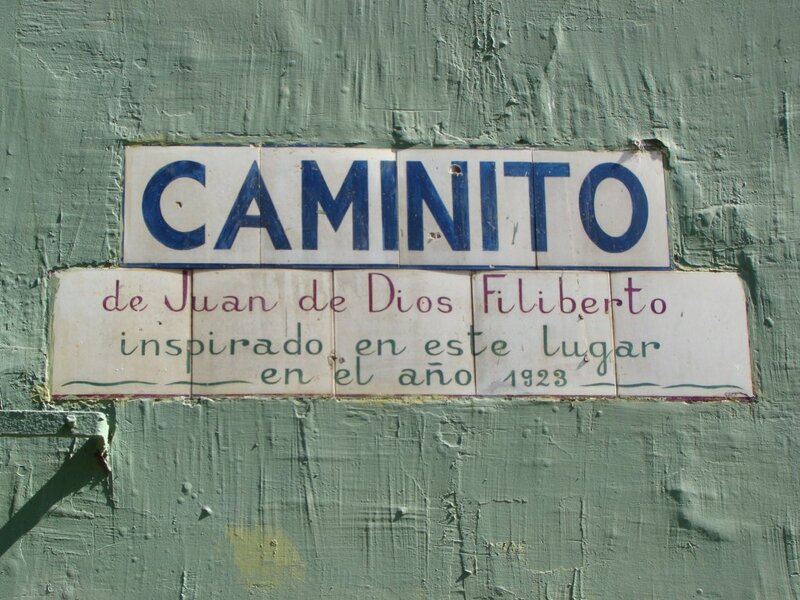 The cobble stone tree line streets brought out the best in the low-rise colonial style architecture with many houses dressed in pastel colors and a touch of graffiti. 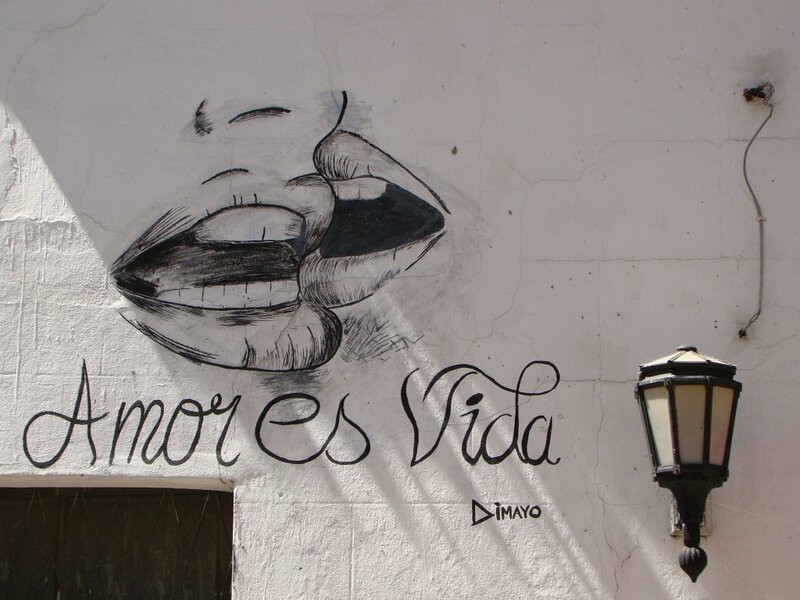 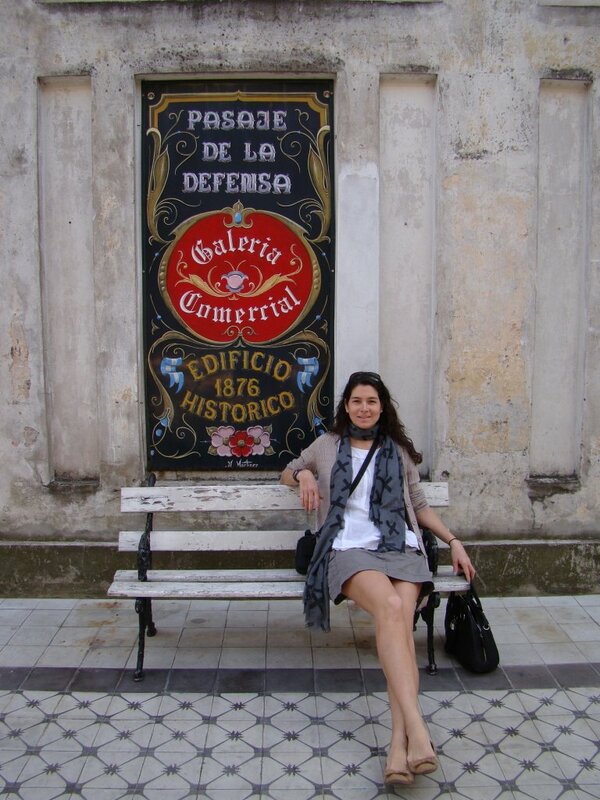 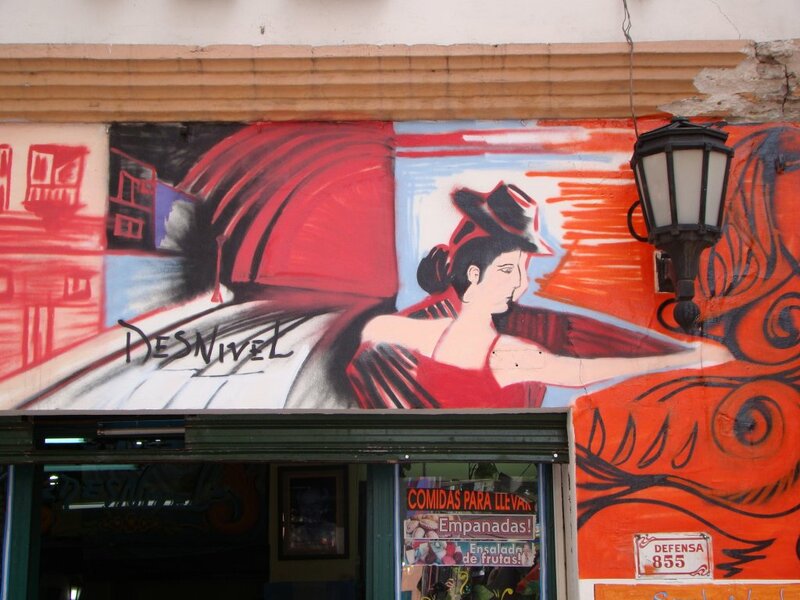 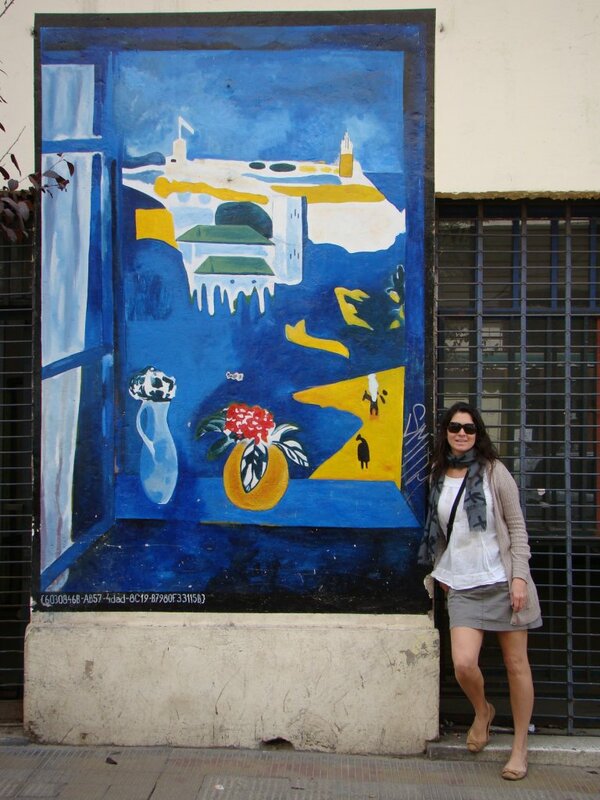 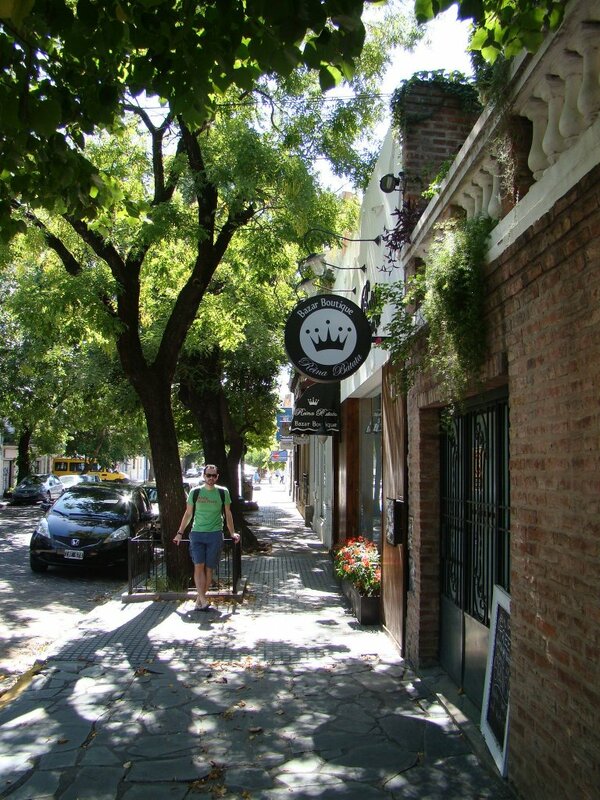 Palermo Soho emanated a chill vibe with a hint of sophistication and loads of street art. 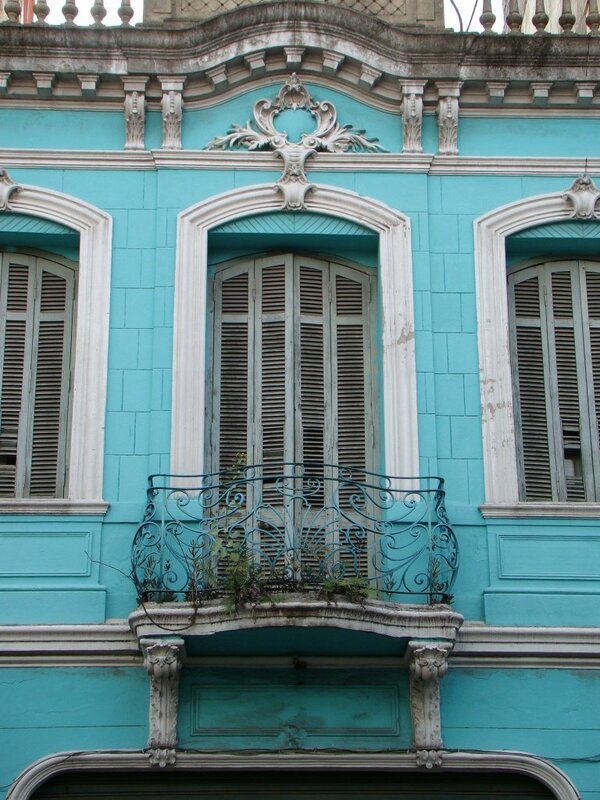 It was tough to spot an untagged building or facade. 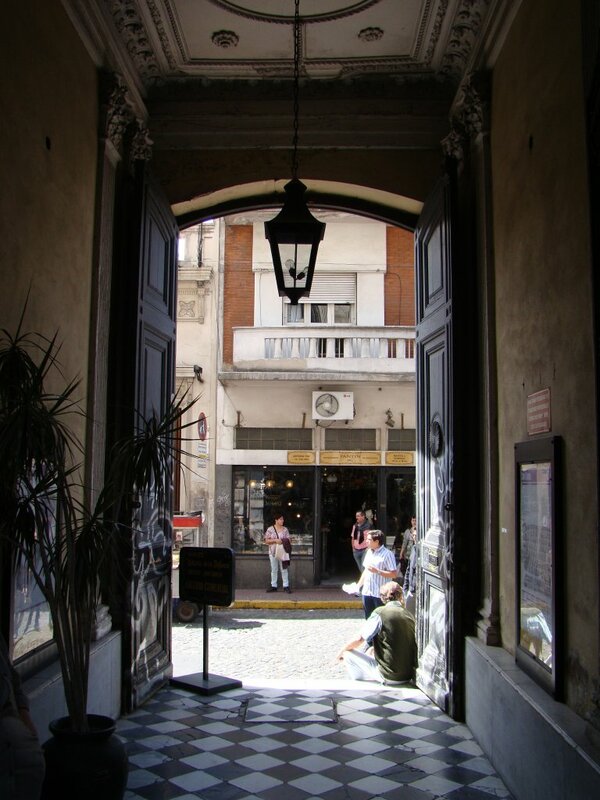 This barrio was also where we enjoyed a couple of typical Argentine dinners including the delectable “bife de chorizo” or sirloin steak paired with Malbec from Mendoza (the country’s top producing wine region). 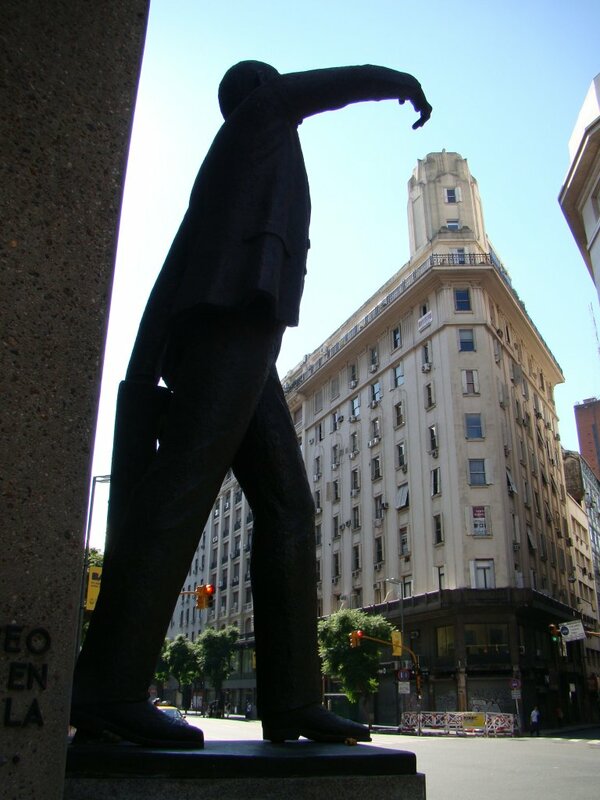 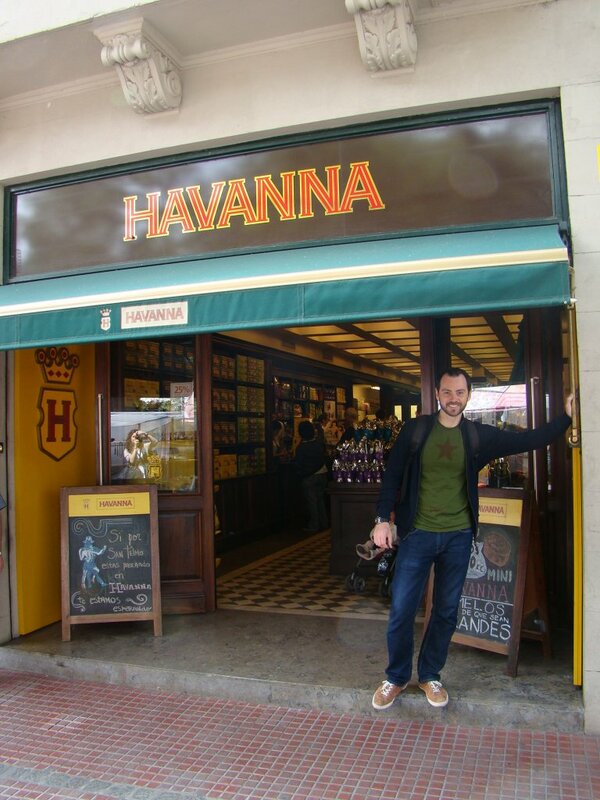 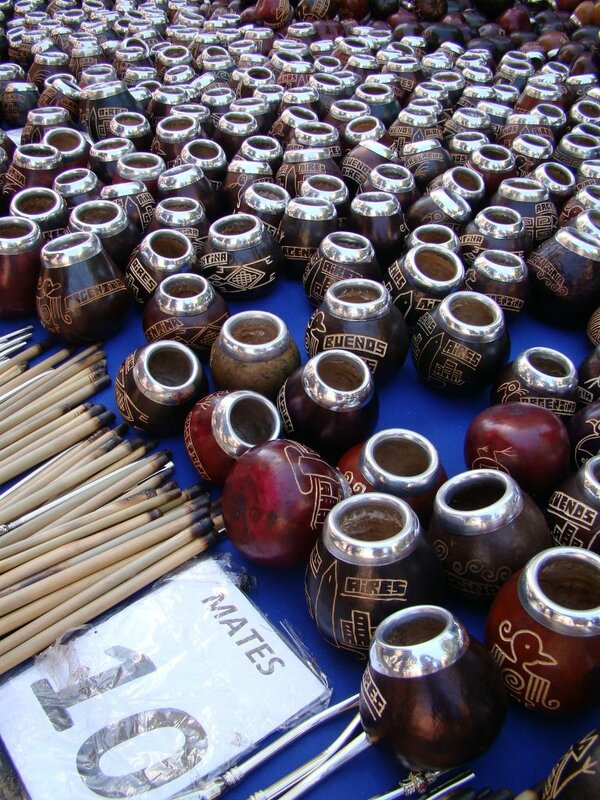 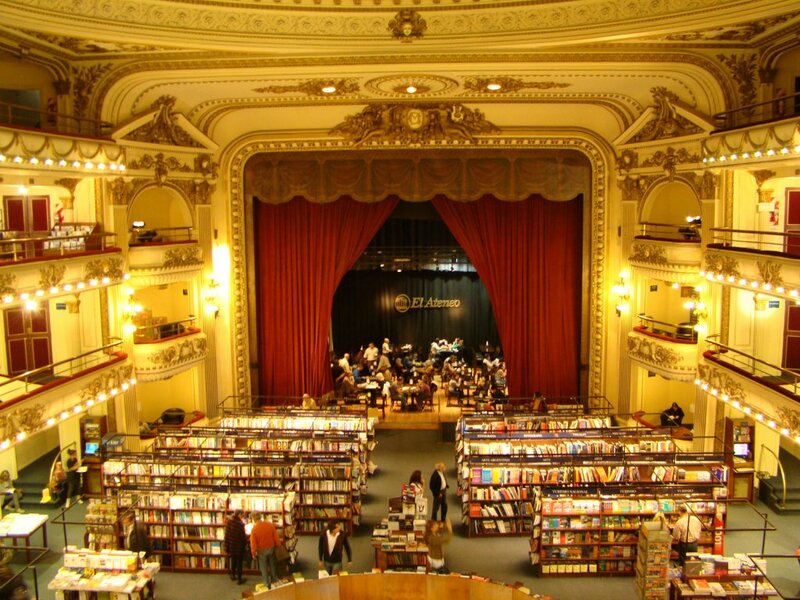 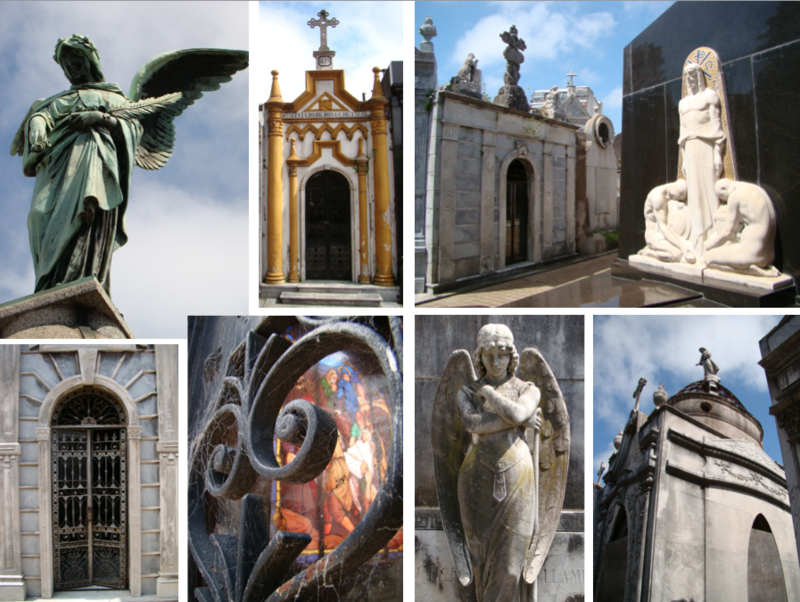 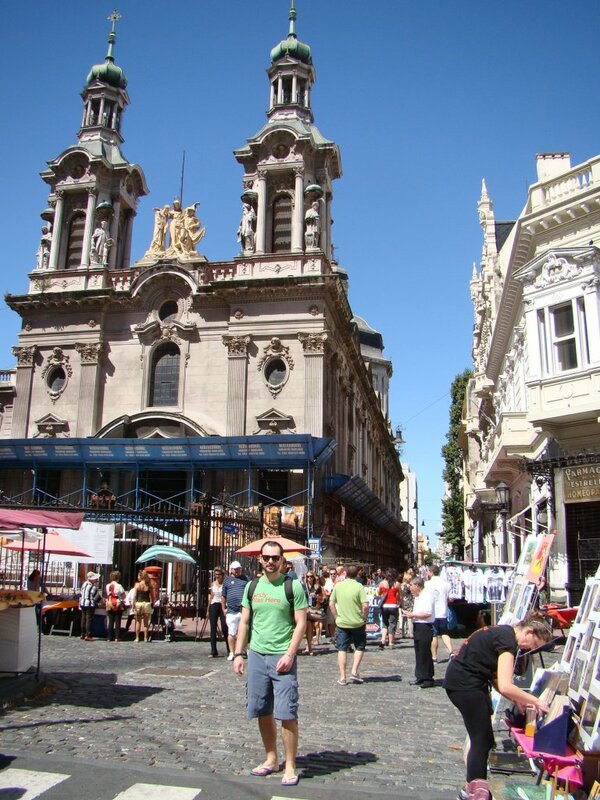 Buenos Aires fueled our imagination and made it easy for us to get entrenched in its deep and diverse cultural heritage. 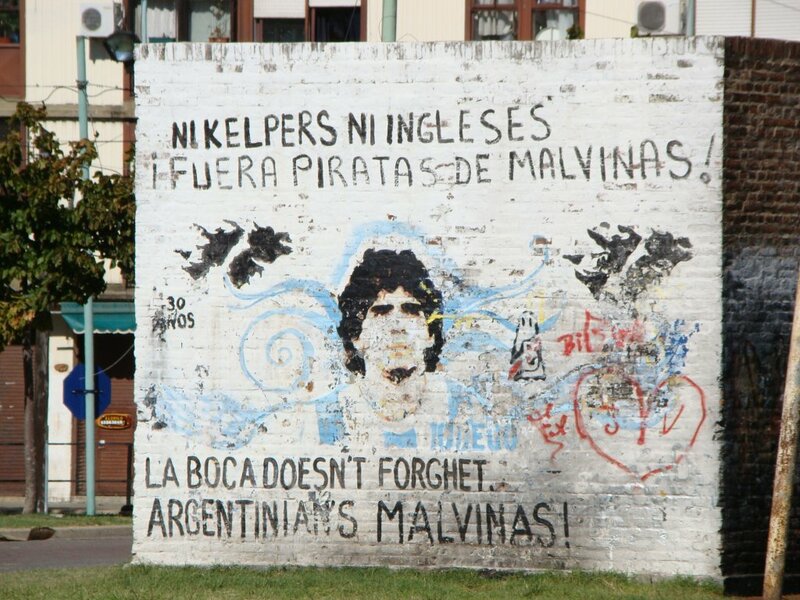 We hope one day to return to this South American capital. 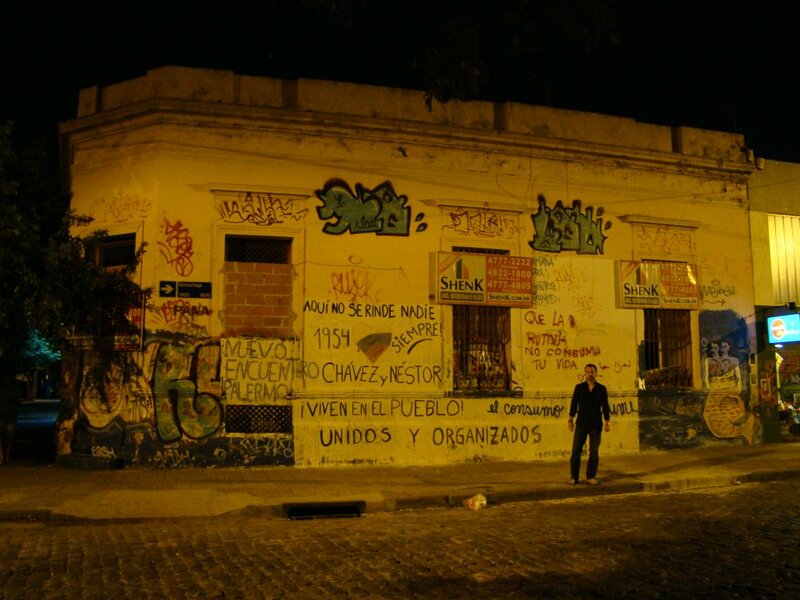 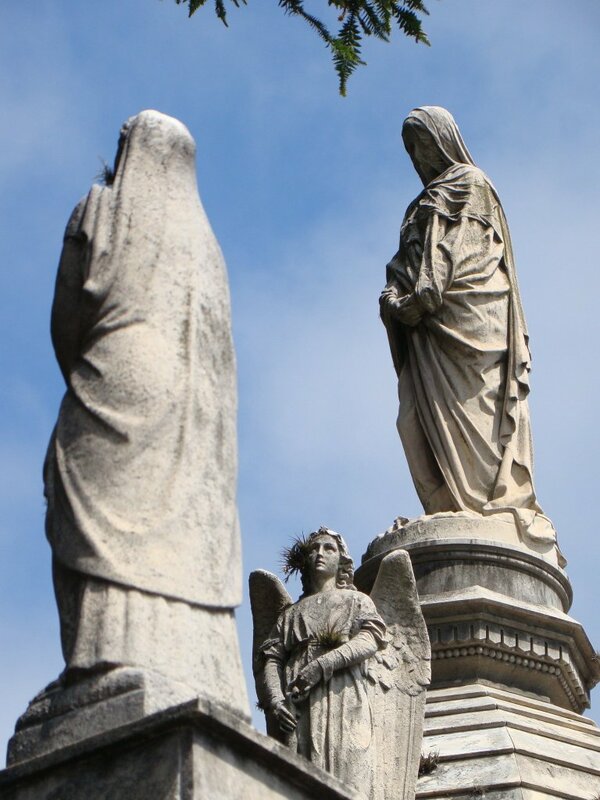 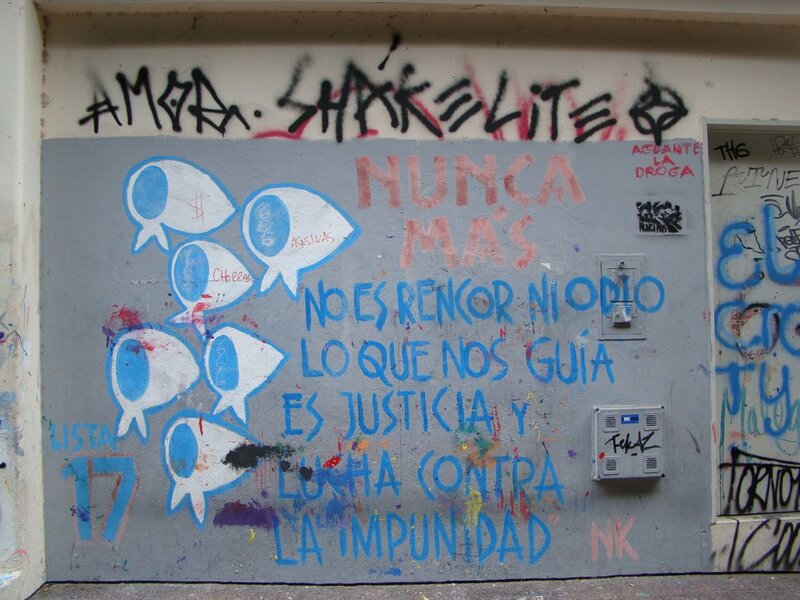 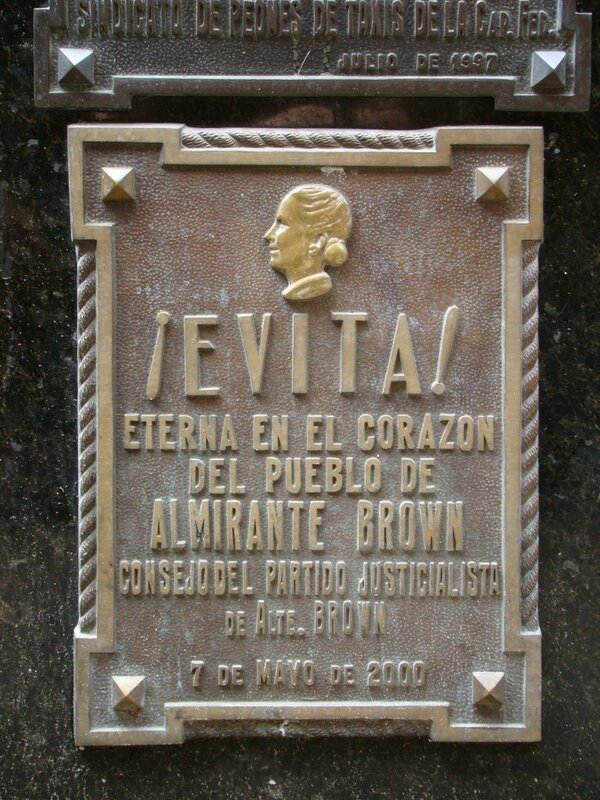 This entry was posted in Argentina, Buenos Aires, Post a.b. 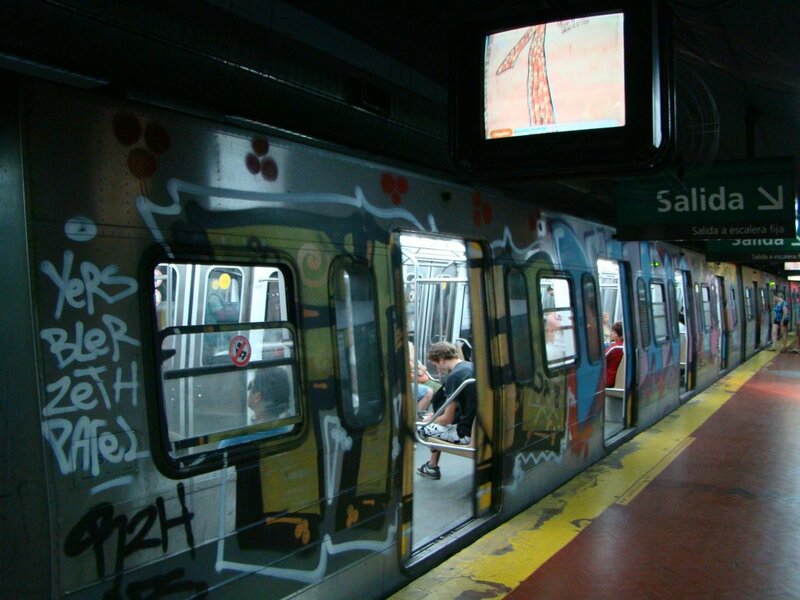 journey Trips and tagged Bife de Chorizo, Boca, Buenos Aires, Carlos Gardel, Graffiti, Palermo Soho, Quilmes, Recoleta, San Telmo on March 30, 2013 by lexussin. 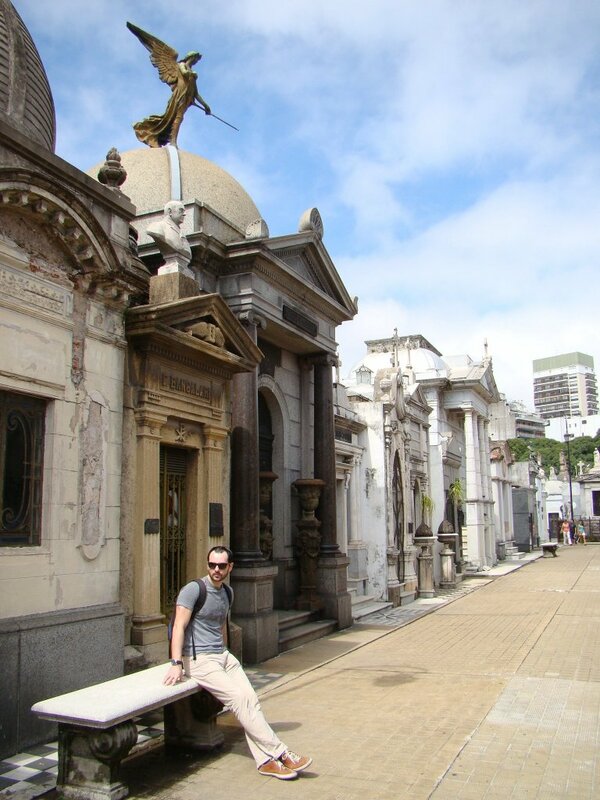 Alex, so happy you decided to write about Buenos Aires! 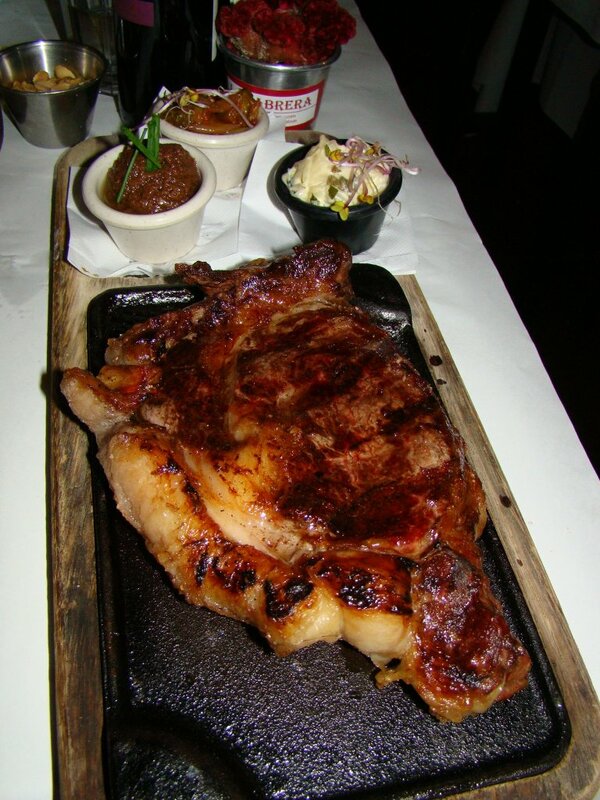 Glad to hear it, thanks Robert!